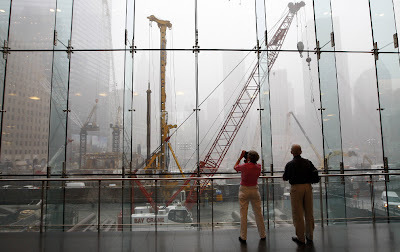 Tourists look out over the construction taking place on the World Trade Center site in New York City, two days before the seventh anniversary of the attacks of September 11, 2001. 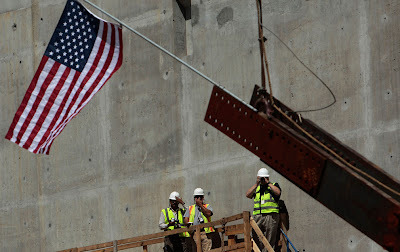 Workers at Ground Zero watch and take pictures as the first beam for the future 9/11 memorial is raised into place September 2, 2008 in New York. 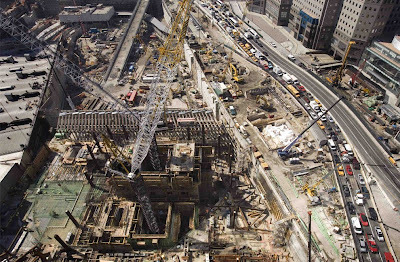 Construction workers started erecting the frame of the National September 11 Memorial and Museum nearly seven years after the terrorist attacks destroyed the World Trade Center. 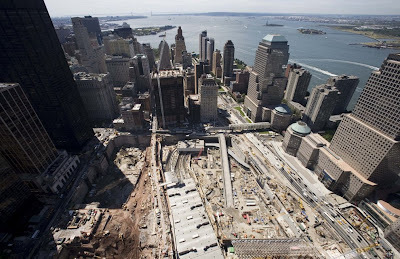 The World Trade Center site, under construction Thursday, Aug. 28, 2008 in New York. In the distance, to the south, the Statue of Liberty and Verrazano-Narrows Bridge can be seen. Traffic passes the construction site of the Freedom Tower . 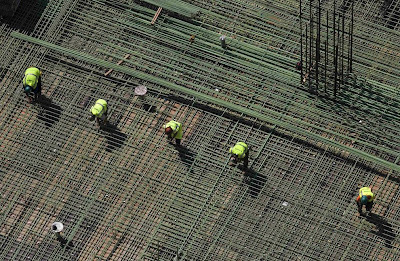 Workers tie steel reinforcing bars in place prior to pouring a concrete floor at the Freedom Tower construction site Friday, September 5, 2008 at the World Trade Center site in New York. 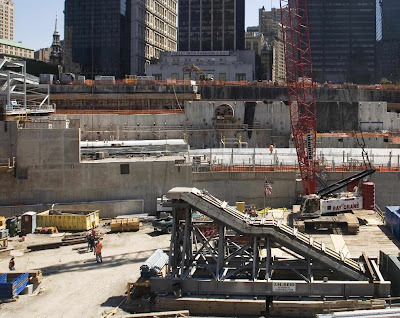 The Survivors' Staircase, center, is shown at the World Trade Center site Tuesday, Sept. 2, 2008 in New York. The staircase, the escape route from the World Trade Center for many survivors of the attacks of September 11th, will become part of the National September 11 Memorial & Museum. 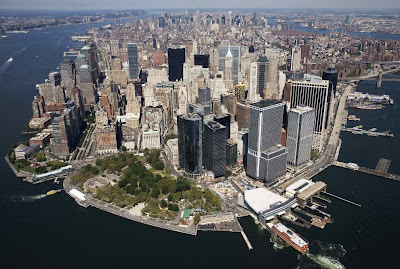 An aerial view of lower Manhattan on Monday, Sept. 8, 2008 in New York City. The Staten Island Ferry can be seen at lower right, and the site of the World Trade Center can be seen just left of center, where the white cranes are just visible. 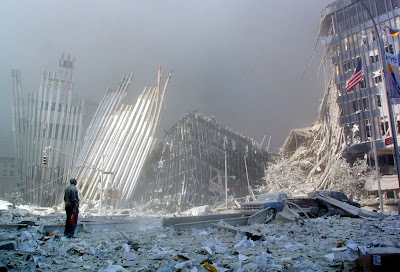 And, a brief look back at the scene of the attacks in New York in September, 2001. 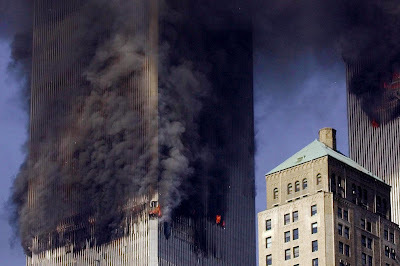 Seen here, the twin towers of World Trade Center burn after two planes crashed into each on September 11th. New York City, seen by one of the Expedition Three crew members onboard the International Space Station (ISS) on September 11, 2001. 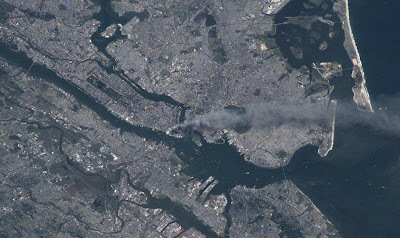 The image shows a smoke plume rising from the Manhattan area. The ISS was flying at an altitude of approximately 250 miles. 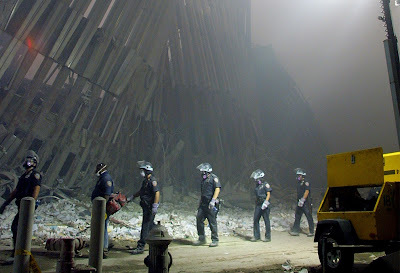 A man stands in the rubble, and calls out asking if anyone needs help, shortly after the collapse of the first World Trade Center Tower 11 September, 2001, in New York City. 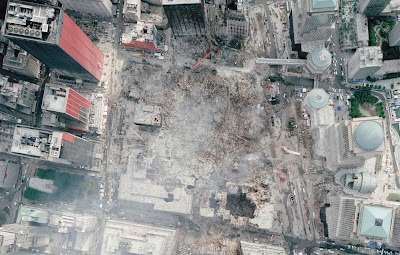 An aerial view of the scene of the World Trade Center attack, taken 12 days later, on September 23rd, 2001. The image was taken by the National Oceanic and Atmospheric Administration (NOAA), from their Cessna Citation Jet, from an altitude of 3,300 feet. Sherill Moulton, left, a flight attendant for United Airlines, and Sara Nelson, right, a flight attendant for American Airlines, comfort each other as they tour a memorial dedicated in Boston, Tuesday, Sept. 9, 2008, to passengers and crew killed on planes that flew from Logan International Airport on Sept. 11, 2001. Both women had colleagues who were killed on the planes. The 8:14 a.m. departure time for Flight 175 is inscribed on the panel, rear.